The ball has dropped, the confetti has been swept out of Times Square, and 2018 is in the books. It’s time to look back and take stock of what we learned from and about OSHA over the past year. More importantly, it is time to look at what we can expect from OSHA as we transition to the out years of President Trump’s first term. In this webinar event, attorneys from the Partners in the OSHA Practice Group at Conn Maciel Carey will review OSHA enforcement, rulemaking, and other developments from 2018, and will discuss the top OSHA Issues employers should monitor and prepare for in the New Year. OSHA’s controversial E-Recordkeeping and Anti-Retaliation Rule has been challenged and criticized by stakeholders since its inception, with expectations that OSHA under a Trump Administration would revise or rescind the Rule. Despite all that, multiple enforcement deferrals, and two legal challenges that were Stayed pending the Trump Administration’s re-evaluation of the Rule, all elements of the rule are currently in effect, including injury data submission requirements and limits to post-injury drug testing and safety incentives. Indeed, the Trump Administration has done very little to narrow the Rule. On July 30, 2018, OSHA issued a notice of proposed rulemaking to eliminate only the requirement for very large establishments to submit 300 and 301 data, but did nothing to alleviate the data submission burdens on smaller employers, and did not address the controversial anti-retaliation provisions at all. Also, the delinquent State OSH Programs are catching up with Fed OSHA’s E-Recordkeeping requirements. Not to be confused with E-Recordkeeping, OSHA’s Significant Injury and Fatality Reporting Rule, has created significant new interactions between employers and OSHA since it went into effect in January 2015. 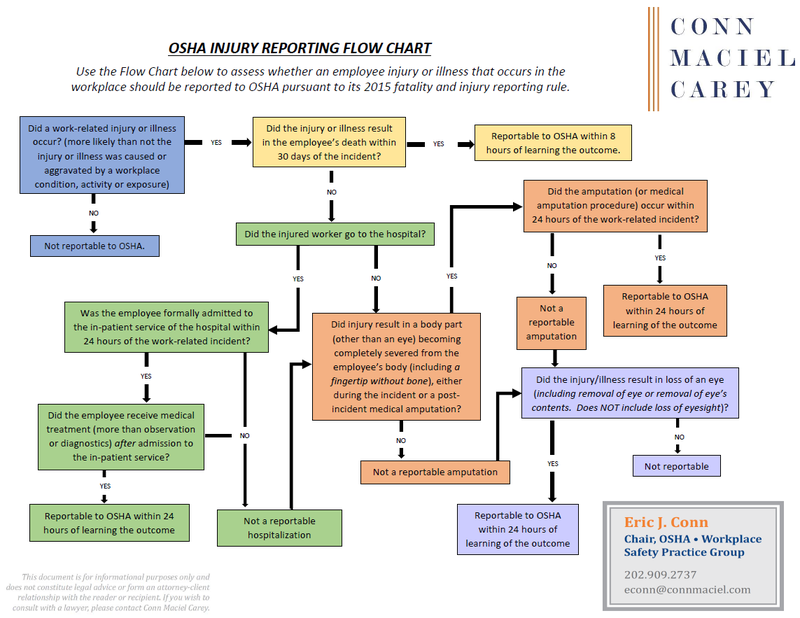 Many employers still wrestle with the nuances of when and how to report significant injuries, hospitalizations, amputations, and fatalities to OSHA. In particular, employers are frequently over-reporting hospitalization events and struggling to determine what constitutes a reportable amputation. More than two years after OSHA published the E-Recordkeeping Rule, the agency finally revealed some of its plans for how it will utilize employers’ 300A injury data collected under the new Rule. In late October 2018, OSHA launched its new Site-Specific Targeting Enforcement Program, which outlines how the agency will select non-construction establishments for programmed inspection. OSHA will create targeted inspection lists based on employers’ higher than average Days Way, Restricted or Transfer (“DART”) injury rates. OSHA will also include a random sample of establishments with lower than expected injury rates for quality control. Thus, all employers covered by OSHA’s E-Recordkeeping Rule may be subject to an SST inspection.. When OSHA receives a complaint related to employee safety and health or a severe injury report, one action by OSHA is to give the employer an opportunity to respond before it takes the more extreme action of opening an inspection. In addition, when OSHA receives an allegation of retaliation, it must provide the employer a chance to explain why the action of which it is accused was legitimate or did not occur as alleged. These responses are an opportunity for the employer to provide sufficient information to avoid an inspection or litigation of a retaliation claim. A strong response could appease OSHA’s concerns and resolve the complaint or report in a favorable manner for the employer. However, these responses can also create a written record of admissions to which OSHA can hold the employer accountable, and any supporting documentation may be closely scrutinized and used to create liability. Thus, employers must be strategic about the information they share at this early stage and should ensure there is a procedure in place for managing and developing these responses. The state of California’s Division of Occupational Safety and Health, better known as Cal/OSHA, is perhaps the most aggressive and enforcement-heavy approved state OSH Program in the nation. California employers face a host of requirements that other employers around the country do not. Likewise, the Cal/OSHA inspection and appeal process creates several unique landmines for California employers. Of particular significance in the coming year, California employers should be on the lookout for new E-Recordkeeping injury data submission requirements, a new focus on finding Repeat violations, and the real roll-out of new rules promulgated last year, such a ergonomics in hospitality, workplace violence in healthcare, and others. ​OSHA made several significant changes to its standards during the late stages of the Obama Administration. After a several decades long effort, it updated the Walking Working Surfaces Standard (the regulation covering slips, trips and falls). It published its controversial E-Recordkeeping Rule for injury and illness data submissions. It also promulgated two new occupational health exposure standards for silica and beryllium after years of rulemaking. And, it brought its Hazard Communication Standard (the chemical right-to-know regulation) more in line with the United Nation’s Globally Harmonized System of Classification and Labeling of Chemicals. To name a few. But, as midnight fell on the Obama Administration, so too did it fall on the fates of these rules. Or did it? While some executive agency regulations have been subject to additional rulemaking (or, more accurately, rule-rescinding) as expected given the Trump Administration’s promise for deregulation, others have remained untouched. So, what is the fate of these, and other, midnight Obama-era OSHA rules? In this webinar, we will make our predictions as to where the Rules may be headed, and offer our advice for how employers should prepare for OSHA enforcement in these areas. Changes made to the Walking Working Surfaces Standard, E-Recordkeeping Rule, Silica and Beryllium Standards, HazCom Standard, and other rules during the Obama Admin. Confounding expectations, OSHA under Pres. Trump has continued the same aggressive enforcement model as we saw during the Obama Administration. We are seeing more inspections, higher penalties, record numbers of $100K+ citation packages, and a continuing rise in willful and repeat citations and worker safety criminal prosecutions. OSHA has also continued its aggressive inspection strategies that create a minefield for employers. In short, the consequences for employers being caught ill-prepared for an OSHA inspection, and making bad choices during an inspection, are more dire now than ever. Employment relationships can take many forms, and employers’ perceptions of their legal responsibilities for certain workers is not always reality. An employer may classify workers as temporary workers or independent contractors, but that does not mean the Dept. of Labor will agree. This is particularly challenging due to continuous changes in the law relating to these types of employment relationships. One particular area in flux over the past several years has been the joint-employer standard, significantly expanding in the Obama-era NLRB decision in Browning-Ferris, but in the wake of change through an ongoing NLRB rulemaking. Similarly, the boundary between employees and independent contractors has also been a moving target. Although the prior Administration took the view that a majority of workers should be treated as employees in its guidance to employers, the Trump Administration has signaled a change in direction. ​Even where there is not a legal employer-employee relationship, companies may have certain safety and health obligations and potential liabilities depending on their role at multi-employer worksites or the use of temporary workers. Protecting temporary workers and enforcing the responsibilities of host employers and staffing agencies was a priority of OSHA in the Obama Administration, and the Temporary Worker Initiative it initiated continues today. OSHA has also continued to defend its multi-employer worksite enforcement policy through legal challenges. Working with electricity can be dangerous, and electrical safety has long been an enforcement priority for OSHA. OSHA’s electrical standards are designed to protect employees against hazards of electric shock, electrocution, flash fires, and explosions. Too often, workers and/or their employers are unaware of the potential electrical hazards present in their work environment, or more often, they are unfamiliar with the nuances of OSHA’s regulatory requirements in this area. Steps employers can take to avoid reduce exposure to electrical safety hazards and OSHA violations. In addition to OSHA’s myriad Safety regulations, the agency has also promulgated approx. 30 comprehensive Health standards, and established air exposure limitations for an additional 500 common chemicals present in U.S. workplaces, such as asbestos, lead, and silica. Knowing when and how to conduct monitoring is complex, and the chemical sampling data collected can be a double-edged sword. This webinar will help keep you clear about the requirements of OSHA’s occupational health standards, provide useful guidance and tips on the types and frequency of air monitoring or other chemical sampling that may be required or warranted at your facilities, and the programs to implement if you do experience exposure levels above the minimum regulatory thresholds (or other industry consensus thresholds). Following the tragic West Fertilizer explosion in 2013, then-President Obama issued an Executive Order directing OSHA, EPA and other agencies to “modernize” the way the government regulates chemical process safety. OSHA and EPA took sweeping actions in response to the Executive Order, from enforcement initiatives (like a new wave of Refinery and Chemical Facility PSM National Emphasis Program inspections) to rulemaking and interpretation letters to overhaul OSHA’s PSM and EPA’s RMP regulatory landscape. Then President Trump took office with a de-regulatory agenda, leaving the regulated community to wonder what this meant for these changes to process safety regulations. But rather than a continued wave of action, the momentum splintered, with some initiatives proceeding, others coming to a halt, and others still being pared back. We saw immediate delays and the beginning of rollbacks of new process safety regulations, yet enforcement initiatives appeared to move forward unhindered. And now, with two years of the Trump Administration in the books, it is still unclear where the regulatory landscape will settle. This webinar will review the status and likely future of OSHA’s PSM Standard and EPA’s RMP Rule, as well as other major process safety developments from the federal government, state governments, and industry groups. Nearly 2 million American workers report being victims of workplace violence each year, and many cases go unreported. At the same time, the #MeToo movement has brought renewed focus on sexual harassment in the workplace. While there are no OSHA standards for workplace violence or sexual harassment, the General Duty Clause requires employers to provide employees a place of employment free from recognized serious hazards. Over the years, OSHA has issued General Duty Clause citations to employers after incidents of workplace violence or harassment. Recently, one OSHA Regional office initiated an inspection after a pediatric services employee was sexually assaulted by a client’s father after complaints were made to the employer by other employees about the alleged abuser. The EEOC, meanwhile, continues to focus on sexual harassment, having recovered nearly $70 million for employees claiming sexual harassment through litigation and administrative enforcement in FY 2018, up from $47.5 million in FY 2017. The question remains, however, whether OSHA will expand efforts to investigate and/or address sexual harassment, particularly in those workplaces where it is foreseeable or preventable.